Korean traditional teas are becoming increasingly trendy, as people show more and more interest in leading a healthy lifestyle. Although the term ‘traditional tea’ usually refers to tea brewed from loose tealeaves, Korean traditional teas also include drinks like citron tea, ginger tea, and Chinese matrimony vine tea, which are also made from natural ingredients. Traditional teas have a myriad of health benefits, including the ability to either warm or cool one’s body. They also offer a special intangible something that eases our minds and brings people closer together. It’s no wonder that the unique taste and characteristics of Korean tea are causing tea drinkers worldwide to sit up and take notice. As one of the most popular teas in Korea, green tea has firmly established itself at the forefront of the well-being boom of the 21st century. The effects of green tea are well-known to the public. Green tea’s somewhat bitter taste comes from an abundance of catechins, which are believed to help fight against cancer and bacteria, reduce body fat, and lower cholesterol and blood pressure. Green tea is also known to contain vitamins that are good for your skin. The taste of green tea varies, depending on the temperature of the water. 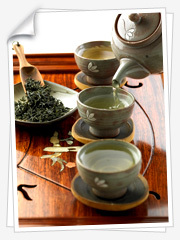 Green tea is best served after being steeped in waters reaching temperatures of 60-70°C. Preparing your tea in a proper tea set also makes the green tea experience just that much more enjoyable. Traditional teas go beyond just having exquisite taste; they also help prevent a number of common ailments. Long ago, the Korean people were able to skillfully decipher the specific effects of each tea, allowing them to incorporate tea as part of a lifetime of healthy living. Particularly popular during the winter, citron tea contains ample vitamins. Its most famous advocate was King Sejong the Great, who created the Korean alphabet. Citron tea helps to suppress coughing, relieve hangovers, and is incredibly effective in curing indigestion. The tea is made by adding a pulpy mixture of citron and sugar or honey to a cup of warm water. Depending on the weather, plum tea is good for either cooling or warming one’s body. It is effective in overcoming fatigue and preventing food poisoning and is used as a remedy for upset stomachs. Its curative effects are so wide-known that almost every household is in Korea is busy making plum extract in July when plums are in season. Despite its nice smell, quince fruit tastes somewhat sour and bitter; this is why it is used to make tea, not eaten raw. Tea made with sliced quince preserved with sugar can be effective for sore throats that are due to either dry or cold weather. Called Omijacha (five-taste tea), this tea boasts five different tastes: sweet, sour, bitter, salty, and hot. It’s very effective in relieving thirst and fatigue, making it an essential dietary supplement during the summer. Ginger tea is a favorite among Koreans during the winter. It helps to stimulate blood circulation and warm one’s body, keeping the cold at bay. Typically, peeled ginger is put into boiling water for 15 to 20 minutes. When mixed with sugar, ginger has a unique sweet and tangy flavor. Jujube tea has a sweet and rich taste when boiled in water for a lengthy period of time. It’s effective in slowing down the aging process and calming the nerves. For those who suffer from frequent stress and/or sleeplessness, jujube tea is a terrific natural cure. Sikhye and Sujeonggwa are main traditional drinks, especially made and served on national holidays or special occasions. In olden days, families used to sit together and drink cold Sikhye or Sujeonggwa during the wintertime. Nowadays, both beverages are sold in cans or bottles in grocery stores year-round. Made of sweet rice and malt, Sikhye has a sweet and smooth taste. Made of ginger, cinnamon, and dried persimmon, Sujeonggwa tastes sweet, but spicy. 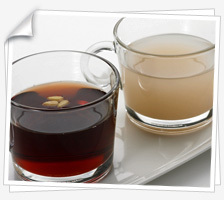 Both drinks are frequently served as a dessert in Korean restaurants, helping to aid digestion.